Learn from the experts through high-quality video courses. Complete challenges embedded right in Excel. Earn achievements and unlock rewards as you grow your knowledge and skills. Don't have Excel 2016+? Use the addin with Excel online (requires a free Office 365 account). Learn how to use functions to bring your spreadsheets to life. Deep dive into mathmatical averages, weighted averages, averaging functions and more. Learn the ins and outs of using IF statements and other conditions in your spreadsheets. Master advanced IF statements and learn ways to manage complex conditions. 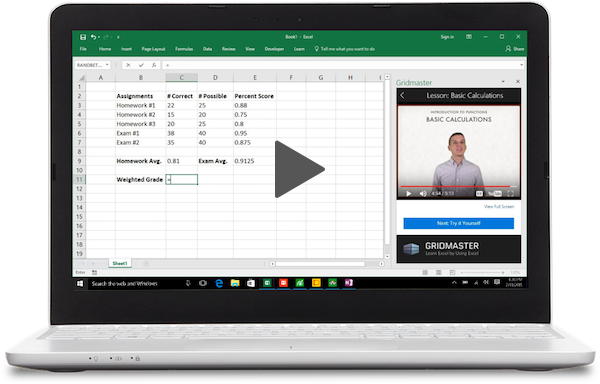 Discover VLOOKUP and learn how to leverage its power to reduce duplication and save time. Try it out, risk free. The first course is on us.